If you’re a fan of smooth, floating video shots from unique angels (often a bird’s eye view), then no doubt you will love the style of video you can make using a video camera attached to a drone. This video above was created by Dale Parrish, a retired firefighter living in Tulsa, Oklahoma. Dale is married to my childhood friend, Lee Ann. Dale has expanded what started as a hobby into a new business venture called Hover Visions. 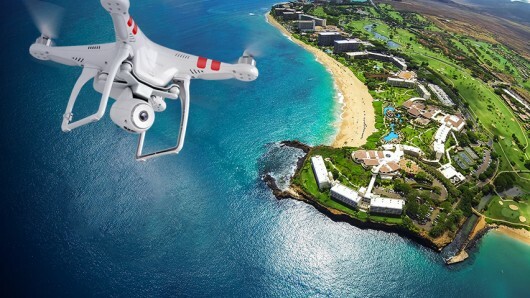 Dale uses a DJI Phantom 2 Vision Plus drone. That model comes with an attached camera that shoots full HD video at 1080p 30p/60i. It also takes 14 megapixle stills. Other models don’t come with a camera, but you can attach one. The Go Pro is a popular choice for drone video. With the Phantom 2 Vision Plus, you control it from the ground using the control box you see pictured with the drone. It has two levers, one for throttle and one for rotation. You can view the camera shot on the monitor attached to the control box. The drone has GPS and Gimbal image stabilization features which allows it to get silky smooth shots. You can plot its course from your tablet. You can set it to automatically return to its starting point, even if you have somehow lost contact. Now if that doesn’t qualify as amazing, I don’t know what does! However, drone videography does raise many issues. Certainly safety issues come to mind first. Privacy issues are a close second. As the trend of drone video production grows, chances are high there will be lots of regulations put in place. After all, no one wants their neighbor sending a drone video camera over to spy into the bedroom window. Today however, there are not substantial regulations in place other than some safety guidelines. Here is an article from Videomaker magazine that goes into detail on the legal issues surrounding drone videography, which are indeed substantial. 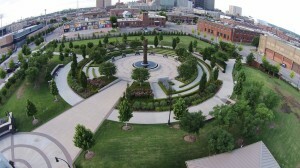 Aerial photography has long relied strictly on airplanes or helicopters. That, of course, is expensive. Airplanes and helicopters are also quite large and can not go into all the nifty places a 3-pound drone can. Obviously drones would have the disadvantage of not being able to go as high or as far as an airplane or chopper, but not every aerial photography assignment calls for those abilities. Drones now give anyone the ability to get dramatic aerial video shots that are silky smooth. As Dale’s video demonstrates, “aerial” might actually mean just a few inches off the ground. The small size of the drone creates new possibilities. I do not think the nice folks at Post Oak Lodge would have wanted an airplane or helicopter flying so close by, no matter how awesome the resulting video. 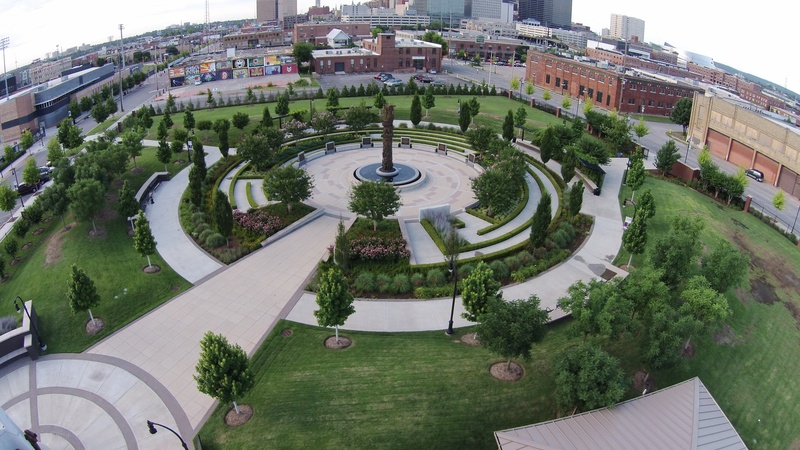 Aerial shot taken by Dale Parrish with his drone camera. The video Dale made on the resort is meant to showcase the beautiful facility. Any fairly large operation would do well to use similar footage in their promotional videos. The unique and unusual angles the drone gives you make for highly interesting shots that give a far more dramatic perspective than any static wide shot taken off a tripod. Dales is a retired fire chief, so spent years working at the scene of fires. He is convinced drone videography would be a great aid to firefighters. With the drone’s ability to get a bird’s eye view, commanders on the ground would be able to make more informed decisions about where to send people and equipment. Dale is also working with agricultural experts to use drone videography to show farmers where their crops are having drought or disease issues. I can see using drone video cameras in a similar way to inspect bridges and buildings. The real estate industry has latched onto drone videos to showcase larger properties and even entire subdivisions. There are dozens of applications for the style of video you can shoot using a drone. This absolutely spectacular fireworks video shot using a Go Pro attached to a drone has gotten over 8 million views on You Tube. A word of caution however. This video got so much attention that many people are raising safety concerns and saying using drones in this fashion should be illegal. The possibilities of drone video are both exciting and frightening. As a video geek, I get all giddy over new ways to make building shots look awesome. On the other hand, it is easy to see how drone video could be every peeping Tom’s dream come true. Let’s vote today for the positive uses and hope all the scary James Bond type scenarios do not come to pass. Lorraine, Thanks for putting my drone video on your site. I enjoyed our conversation about my business and the tips you gave. Wanted to correct only one thing in your post and that was about me using drones at fire scenes when I was still a Fire Chief. Drones, like the one I use, were not available 3 to 4 years ago. After I retired, I began looking into drones and drone technology and pursued the idea with the thought in mind of using a drone to provide needed information at the scene of a fire to the incident commander. I know I certainly would have jumped at the chance to have a drone on one of my scenes to assist me in resource management. Hi Dale. Thanks for the clarification. I’ll update the text. Maybe you can do use your drone at fires in the future as you grow your business. I bet roof inspectors would love to use a drone and get good shots of the condition of the roof without actually climbing up there. So many creative applications! Thanks for your time and good luck with your drone videos.